NEW ALBANY, IN, (Jan. 5, 2012) – Indiana University Southeast hired two new police officers this week, raising the total number of officers at the University to 11. 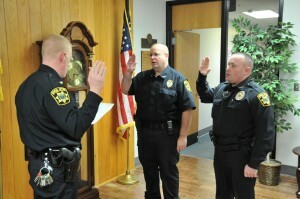 Officers Paul Moakler and Travis Huntley were sworn in on Wednesday, Jan. 4. Before joining University Police, Moakler retired after 20 years with the Louisville Metro Police Department. Huntley has been an officer for two years and has previously worked at the Louisville Metro Police Department and the Clarksville Police Department. IU Southeast Police Officers Paul Moakler, center, and Travis Huntley, right, are sworn in by Chief Charlie Edelen on Wednesday, Jan. 5. Additionally, on Jan. 9 the department will welcome back Officer Theo Comer who is returning after leaving in January 2011 to transfer to the Michigan City Police Department. The Indiana University Southeast Police department is a fully empowered law enforcement agency with a primary jurisdiction of any real property owned or occupied by the University, or on any roads or streets through or adjacent thereto. The department also shares concurrent jurisdiction with, and assists, other local police agencies.